The goalkeepers have an important role on the teams. Therefore, they get their own unique goalkeeper shirt, so players can tell the difference between them and the field players. But in the 90’s the shirts were taken to a whole new level, which made us make this Top 5. This goalkeeper might be one of the all-time best goalkeepers in Croatia. 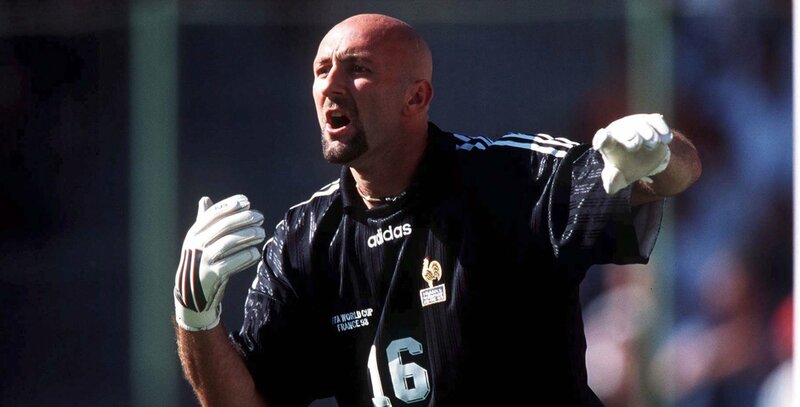 He played 59 times for the Croatian national team and played his first World Cup in 1998. His World Cup debut was a bit above the normal. His performance was brilliant which was seen as a contribution to third-place finish. But Ladić played in a classic 90’s shirt. The shirt was made in the same the design as the field players, but with white and black squares, and with the iconic Lotto logo at the collar. What a goalkeeper and shirt. The Swedish keeper has second most caps for the Swedish national team with impressive 143 and was one of the reasons that Sweden got a bronze medal at the 1994 World Cup. In his colourful adidas goalkeeper kit he saved the last shot in the penalty shootout. He secured Sweden the 3rd place and a 4th on the our Top 5 over goalkeeper kits. When you think of Brazil, then you wouldn’t start thinking off goalkeepers. But Claudio Taffarel might be one of the best goalkeepers of all-time and Brazil. With his Brazil inspired goalkeeper kit, he secures the 3rd place on the list. Speaking of third place, Taffarel was also announced as the 3rd best goalkeeper in 1991 and 1994, and he also secured Brazil the World Cup final game, by saving the penalty in the semi-finals against Netherlands. See the 5 best World Cup haircuts. Yoshikatsu Kawaguchi is litterally on fire. In 1998 he played in the World Cup in France together with the Japanese team. They weren’t known for reaching too far in the World Cup, but rather more for Kawaguchi’s Asics goalkeeper kit. Oversized and on fire he gets placed on the 2nd place on our best goalkeeper kits in the World Cup history. Can’t say if Jorge Campos was more known for his craziness as a goalkeeper or for his goalkeeper kits. One thing is certain! You will never forget this goalkeeper kit after seeing it once. Don’t know if Umbro just took a shirt and threw paint at it thinking this actually looks nice, or if they had some kind of story behind the kit. But the crazy combo of colours, patterns and the man wearing it gives Jose Campos the first place on our list. It’s sad to see that goalkeeper kits are getting more and more neutral with time. I hope that someday the manufactures are going to go back in time and bring back these awesome goalkeeper kit and use the designs for future World Cup!